Reviewed by Kate Divett, Backstage Christchurch. It is a deeply reflective time to be living in Christchurch currently, as we try to make sense of the events of Friday 15th March. We are a city in mourning and in shock. In the fortnight that has followed, we have gathered together in many ways – to grieve those who have been lost, to support those who remain, and in vigils for the peace and way of life we hold so dearly. Gatherings have been important. Showbiz Christchurch thought deeply about whether or not to gather for the opening of their season of We Will Rock You. Their unanimous decision that “the show must go on” was the right one. I have personally found solace in the words of Leonard Bernstein this week: “This will be our reply to violence: to make music more intensely, more beautifully, more devotedly than ever before” and I held these words in my mind as I entered the theatre doors on Friday night. 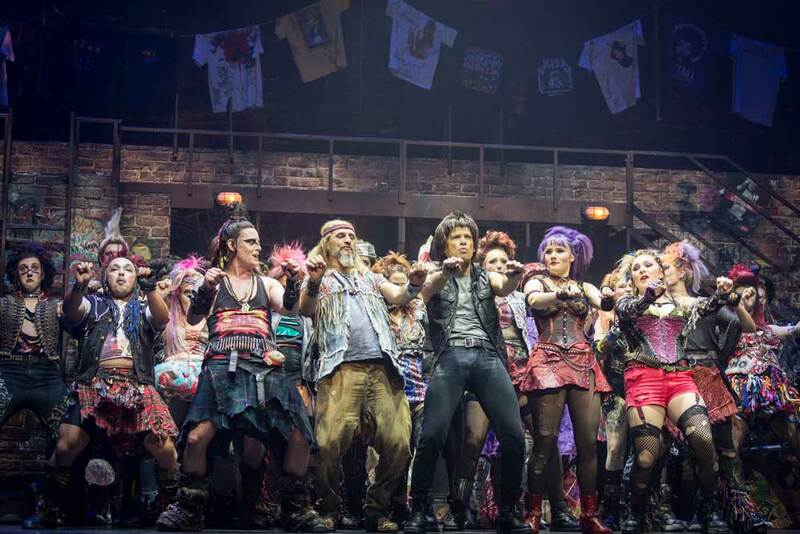 So this is what the cast and crew of We Will Rock You have done: an exceptional, high energy, full noise and lights opening night, and an act of defiance against those who would want our lives interrupted. Bravo and thank you to all involved. With the theatrical music of Queen woven together by the comedic writing of Ben Elton, it’s a winning combination. The story is set 300 years in the future, and the internet has destroyed any sense of community or individualism. Humans conform to mainstream, commercial ideals that are enforced, Big Brother-style, by Globalsoft Corporation. A small group of rebel Bohemians, however, are living counter to this tyranny, believing in a prophecy that a dreamer will come to help them find the last remaining musical instrument that has been hidden on the iPlanet. And there’s obviously a love story in there for good measure, which is brilliant. Okay, the story might be a little bonkers, but we’re really here for the music – and we are not let down. At all. If the title of the show “We Will Rock You” was a promise, then Showbiz have definitely kept it. From the opening strains of ‘Innuendo’, we’re reminded that Queen’s music is intricate, lyrical, and incredibly well-known – especially in the recent success of 2018’s biographical film about Freddie Mercury, ‘Bohemian Rhapsody’. The band set the tone for an epic night of rock immediately, and bravo in particular to Michael Ferrar and Heather Webb for their work on guitars. Brian May’s solos and breaks are some of the more recognisable in music history! The night belonged to the two lead roles though. Caleb Jago-Ward (Galileo) is phenomenal – it’s actually difficult to adequately express how extraordinary his voice is. It is a treat to see him throw himself into what must be a very fun role to perform and apply his vocal talent to. Every song was a winner. Jane Leonard (Scaramouche) is equally brilliant and a fabulous casting opposite Jago-Ward, bringing sass, feisty attitude and some great comic timing. I particularly enjoyed ‘Somebody To Love’, but the duet moments for these two singers – particularly in ‘Under Pressure’ and ‘Who Wants To Live Forever’ were magical. Naomi Ferguson (Killer Queen) and Jack Fraser (Khashoggi) had reliably good performances as the evil counterparts to Galileo and Scaramouche. Ferguson, in particular, had a big role with a big personality to play – and a wig to match – and the vocal range required of her songs would be a challenge for most singers. We have Freddie Mercury to thank for that! Her costumes were wonderfully outrageous, and this is a good opportunity to congratulate Diane Brodie QSM (Costume) and Sarah Greenwood-Buchanan (Hair and Makeup) and their teams for their incredible work once again. Aaron Boyce (Buddy), Catherine Hay (Oz), and Tom Hart (Brit) played excellent parts and contributed even more mouth-dropping vocal performances. I particularly noted that Hart’s voice at times sounded incredibly similar to Mercury’s, particularly in ‘I Want It All’. Hay and Hart have some very funny on-stage chemistry and brought wonderful comedic moments. Boyce plays a fabulous futuristic hipster, a great leader of the Bohemian group. The cohesion of direction, musical, production and technical elements of this production is evident for all to see. The Showbiz Christchurch team should be incredibly satisfied that they are doing their bit to serve the Christchurch community with high-quality moments of escape into the Arts when we need it most. The themes of the show – standing up for what you believe in, acceptance of difference, friendship, and the power of music to unify people – hold an added poignancy that could not have been predicted. The response from the audience on opening night – whooping, hollering, and generous applause throughout, followed by a joy-filled sing-a-long and an emphatic standing ovation – were all confirmation that this is a show that will add to our collective wellbeing. Audiences should secure their tickets before the season sells out and get ready to rock (yeah!). 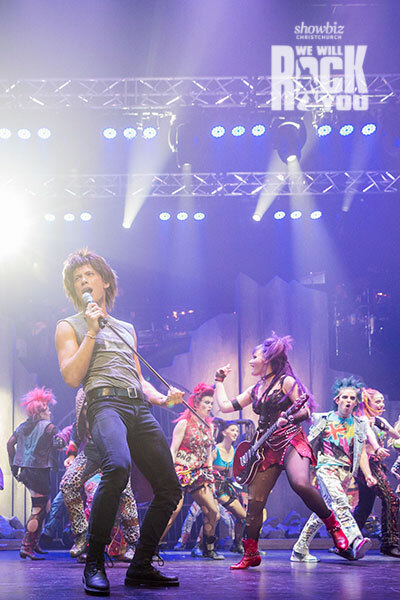 The Showbiz Christchurch Saunders & Co Season of We Will Rock You is on from 29 March – 13 April at Isaac Theatre Royal.